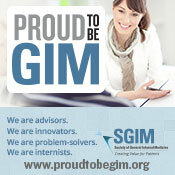 SGIM strives to provide you with the means to sharpen your skills and explore innovative approaches to your work, while empowering you to lead the next generation of general internal medicine. As you explore the many facets of being a member, we hope you will find programs and activities that recognize your needs as a leader in the field and allow you to share your expertise with others in the Society's vast peer-to-peer network. Skills Development Opportunities: Explore innovative approaches to your work. Participate in one of SGIM and ACLGIM’s skills development programs and events like the ACLGIM Leon Hess Management Training and Leadership Institute and the ACLGIM Winter Summit. Annual and Regional Meetings: Share your expertise and sharpen your skills, while learning about the latest issues and innovations in general internal medicine. No matter the format or topic, SGIM meetings are peer driven and membership helps dictate each meeting; ensuring the interests and best practices of general internists. Mentoring Programs: Serve as a mentor to help develop the future of GIM. Offered in a variety of formats, mentoring at the national and regional level provides opportunity for students, residents, fellows, and faculty to access mentors during the annual meeting and have their questions answered on issues around career growth and practicing general internal medicine. Awards and Grants: Apply for national and regional recognition for exceptional achievements and innovations in the healthcare profession, as well as significant contributions to the mission of the Society. Committee and Task Force Participation: Lend your experience and career knowledge to help shape the future of GIM! Interest Groups: Create or join an interest group on a specific or unique topic of interest. GIM Connect: Share your knowledge and learn from your peers, while staying current on new and developing information. Access SGIM’s online members-only community – featuring member directory and collaboration tools – all within a secure environment. Submit and Present your Work: Present or review content to one of the eight meetings SGIM holds each year and have your work recognized by your peers and leaders in GIM through meeting presentation , awards, offered at the national and regional level. Leaders in GIM: Consider joining your peers at the ACLGIM Hess Management Training and Leadership Institute or the Winter Summit, designed to provide resources, collaboration, and networking for leaders in general internal medicine.